Featuring a bevy of household hip-hop names old and new, MTV2 plans to shake things up with its own spin on the classic game show Hollywood Squares. 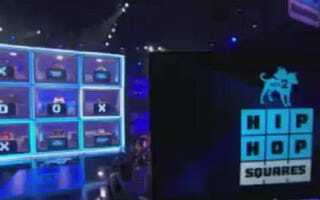 Hip-Hop Squares, which premieres Tuesday, May 22, will feature Nick Cannon, Childish Gambino, Biz Markie, Kreayshawn, Common, Fat Joe and more, all helping out contestants with various trivia questions as they vie for a hefty cash prize. Equal parts shtick and swagger, with an atmosphere of antics that is nostalgically reminiscent of the timeless original, Hip-Hop Squares doesn't disappoint. Hip-Hop Squares premieres Tuesday, May 22, at 11 p.m. EDT/10 p.m. CDT on MTV2. Previous recommendation: Explore the World of African Cinema Online.